You are currently browsing the category archive for the ‘Community’ category. My son harbors the secret hope that the meltdown of the world’s financial markets will shift the mindset of this nation and the world to a much-needed consciousness of sustainability. I see that possibility too, convinced that these great swings into the dark end of the spectrum can also initiate a great swing into the light. A similar “good derived from bad” possibility exists in the smaller scale world of the arts as well. When I found the article below in the U.K. based The Independent, I started thinking of all sorts of ways in which guerilla good works could be conducted in the visual arts. An idea worthy of contemplation. Even in the era of Banksy, some view the work of street artists as little more than graffiti: idle daubings on walls and bus shelters that councils have to pay people to clean up. But those who stumble across works they find littered around London later this week may well be in for a surprise. 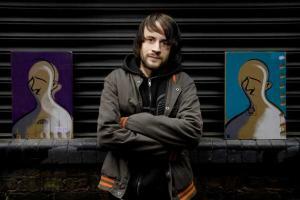 Art worth an estimated £1m is being given away by one of the world’s leading street artists, Adam Neate, in an exhibition that will see 1,000 pieces deposited across the capital and left for whoever wishes to take them. In recent years Neate’s work has graced the fashionable Elms Lesters Painting Rooms in London, yet his roots lie in creating paintings and sculptures designed for urban locations. And this Friday’s Street Art Action marks a return to that way of working – only now his pieces fetch up to £43,000 each. The action will begin before dawn, when helpers will begin distributing the hand-painted pieces on the outskirts of the city, moving inwards towards the city centre as the day goes on. While some will be left at famous landmarks around the capital many pieces will be placed in less salubrious areas of the city – both Lambeth and Hackney will be decorated. The artist’s aim is to reinforce the idea that street art was originally intended to be a gift, free and fun for everyone to enjoy. “It has always been a dream of mine to do a show around the whole of London, to take over the whole city in one go. I want everybody to be able to see it, but once the pieces are out there I don’t mind what happens to them,” he said. Each piece will be autographed, so anyone who stumbles upon an original artwork on Friday, or on subsequent days, will know whether or not the piece is an Adam Neate original. The 30-year-old began leaving pieces of art on the streets of Ipswich early on in his career, but has not left any for the last four years. The value of urban art has sky-rocketed in the past year, with high-profile artists such as Banksy being seen at prestigious galleries and regularly selling for hundreds of thousands of pounds. When the world’s first art sale dedicated to urban art was held at Bonhams auction house in February, 99 per cent of the lots sold. While only time will tell whether urban art will have much lasting value, the street art movement currently has the support of A-list celebrities such as Angelina Jolie, who reportedly spent £200,000 on works by Banksy.